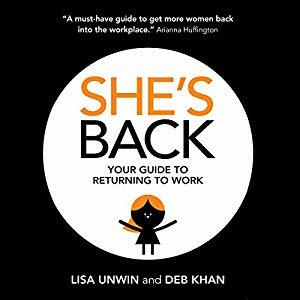 Tell us about your own experience of returning to work, and how that led you to where you are now and writing the book? What are the most common things you hear from women who have taken a career break? “That they are leaving because of a lack of ability to balance young children and career. Couples are making decisions about whose career will take back seat in the months and years to come, but there is no long term plan for how to get back, so when the children get older and the time comes for the person to return to work – and it is still primarily the woman – they have no idea how to get back. I can’t claim to be an expert on gender roles generally, I can only talk about what we see in the circles we work with, but professional women tend to pair with professional men, and statistically marry older men, so in general when children come along it is the woman expected to take the hit and very few see it any other way. So, is there an issue with the way women perceive themselves when taking a career break? Are there other things at play when it comes to a loss of confidence in your career? What practical steps do you talk about in the book to help people prepare for and come back from a career break? “First, everything is so much easier if you have kept in touch with your industry and colleagues – if you haven’t it is much easier now to seek them out and reach out again – gone are the days of the gatekeeper PA and trying to book an appointment to meet senior people. Being on LinkedIn is essential as that is where all jobs and connections are. People are really willing to offer advice and take time to meet you if you reach out to them, especially those that know what you are good at. You need to have those conversations to bring the other side of you back out. Take part as much as you can while you are out of the workplace – networking events, online webinars, parent meetings, whatever will put you in touch with the right people – it’s all in your hands to open the door and get out there. Don’t feel it is insurmountable, remember that there are other ways to work and find paid employment – taking on freelance projects or by joining organisations like Obelisk – every little bit helps to add to your CV, keep your skills up to date, and keep in touch with peers. All this will make it easier to step up when you are ready. A big concern! How do you encourage women to think long term about their career and financial position? “Again, it’s up to us. We can’t just leave it to legislation and employers – only 2% men took up shared parental leave last year, we still have a culture where men fear their career will be harmed if they do, and that will take a long time to change. One thing that we commonly see women returning to work find difficult is how to present themselves on their CV. What advice would you give? “It’s important to see your CV or LinkedIn profile as a marketing tool. Employers spend on average just 8 SECONDS scanning a CV for suitability so your opening paragraph must be compelling – again don’t lead with what you want, lead with what you have to offer. Another thing people don’t often realise is that recruiters use software to scan for keywords in CVs first, so make sure you are hitting all the points from the job description. How should lawyers seek to update their skills to become more employable in technologically fast changing market? Lisa also agrees that being part of platforms like Obelisk Support is beneficial as they provide help keeping skills up to date, such as our recent LexisPSL introductory webinar, and regular events focusing on current developments in the industry. The bottom line as Lisa states is, no one will do it for you. There is support out and information there if you reach out and look for it. Your career and success before you took a break came about because of you and the work you put in – you are still the key to your own success. The journey to the top of a profession is often accepted as being a lonely one, particularly for women. It is one that involves fighting the status quo in small and big ways every day at every step of the way. The perception of the unapproachable, uncompromisingly independent woman going it alone persists in popular culture, and still permeates into real life. Rather sadly, a detailed study by HBR of female CEOs across industries found that most respondents expected little or no support both at home and at work, relying only on themselves to get to where they wanted to be. Is this the harsh reality, and are there actions ambitious women (and men) can collectively take to change the picture? Obelisk Support places great importance on providing a support network for our consultants, and seeking opportunities to connect with leaders and mentors in the legal field. We believe no woman should have to go it alone while carving out a successful career in law. Here is some advice on creating better support networks for aspiring female leaders. Of course, it is easier said than done. If you find the idea difficult, one place to start is with your social media posts. See it not as self advocacy or promotion, but as your story to tell. Sharing the highs and lows of your career journey within an online network can help you become more comfortable about selling your strengths and your ambitions in the workplace. An important part of advocacy is holding up other people as examples and supporting them too. That can include people you work with, people you know, or people outside of your circle whose work you admire. The more you make a habit of talking about the efforts of others, people are more likely to take interest in and rally round those of your own. Your career support network must not simply consist of professional associates – your family and friends also play a significant part. Aoife Flood, Senior Manager of the Global Diversity and Inclusion Programme at PriceWaterhouseCoopers identifies support networks as a series of circles – personal support and advocacy as the widest circle, then professional and workplace, with you the self-advocating individual at the centre. As a mother and a member of a family or partnership, you cannot get to where you want to be in isolation. Sometimes, this will involve difficult conversations at home about expectations and roles within the family environment. Sharing the emotional labour load is a challenge for many professional women, so be honest about what support you need. Outside of the family, talk to your friends about ambitions and life goals on a regular basis – when you are going through a difficult patch you need the people who know you best to reaffirm your aspirations and offer an outside view on what can help you get there. The response you receive will also give you a definitive answer either way as to whether the environment you are working in is where your talents will be nurtured and valued, or whether it is time to seek a new direction. Resist the temptation to emulate the paths of others and try to completely match the habits of high profile career gurus or influencers – they do of course have some nuggets of wisdom, but ultimately you can only build support networks when people have genuine belief in your authenticity and motivations. If you are not sure of yourself, your values and what drives you, it is harder to align with like-minded people and articulate what you need and what you want. Remember ,your success isn’t someone else’s perception of what success looks like, it is getting where you want to be. With that in mind, it is important not to force relationships – as per the advice in our article on networking, go in with a genuine desire to meet and learn from others. Barbara Humpton – U.S. CEO of Siemens. She has held senior leadership roles at other major technology firms, including Lockheed Martin, and Siemens Government Technologies, which works with the federal government on energy and infrastructure projects. Networking is a term that many people have an uneasy relationship with. Most of us want to seem enthusiastic and interested in the opportunity to schmooze with influential peers, but let’s be honest – for most of us, the idea of networking leaves us filled with a sense of dread. For lawyers, more comfortable in front of a screen than in a room full of strangers, networking is an essential business skill to master. Quite simply – don’t overthink it! A simple “Hello, I’m…” and smile goes a long way. If you are attending a talk or seminar as them what they thought of the discussion and take conversation from there. You don’t need to offload your career history; listen first: Ask them who they are, where they’ve travelled from, what brings them here and reciprocate with answers of your own. Remember to say your full name! Why? Well first, so you can be distinguished from the two other Sophies in the room, and it also makes it more likely for people to commit your name to memory. When it comes to work talk, don’t just provide a job title and company name – briefly explain exactly what it is you do and why it interests you. You need to ask yourself not just what you are looking for but what you can offer. As previously mentioned, you shouldn’t have to promise the world or pretend to be what you are not – just show yourself to be genuinely interested and motivated by your work. You want to hear about what interests and motivates people and their passions, rather than a list of achievements or a job title. Others will feel the same. This is the foundation of real connections in work and life – the mutual sharing of ideas and inspirations and telling the story of what led us to where we are today. This TED event talk on active networking talks about how most of us have the wrong idea and approach to networking. He provides some tongue in cheek observations on how we make snap judgements based on appearance, and explains how we often overlook the real value of meeting people and getting to know them, no matter how much ‘relevance’ we think they might have. Of course, it’s all very well having great, energising conversations at an event, but what should you take away from that? If you feel you have more to learn from and/or teach a person, you need to make sure you establish follow up contact. So ask outright: ‘Where can I find out more about you and your company? ‘Do you use Twitter?’ ‘Can I send you an email with more information?’ Some people don’t hand out business cards anymore. They just connect with you on LinkedIn on the spot. If you do use business cards (and nice stationery is memorable in many ways) don’t consign those business cards to an elastic band and a dusty drawer, as Mark E. Sackett says! Track and log the contacts you meet – use an online address book, or Outlook, and be sure to add notes of interest that you learned about them while talking to them. This will help to prompt you to include conversational points in your follow up emails, and keep the rapport going. There is the question of how useful large events created especially for networking really are. For example, this article on abovethelaw.com advises against them, saying “Instead, go to things that matter. Go to talks and seminars and presentations that are actually about something (besides “networking”).” It all goes back to the question of why you are there; if it’s not going to be of real value to you as an individual it’s not worth doing. The best events to go to are the things that genuinely interest and excite you – as that will ensure you bring the best version of yourself to the occasion. It could be better, then, to make a pledge to regularly attend industry relevant talks and speaking events where the opportunities to network are the side product, not the focus aim. Consider more informal soft skill focused groups – eg Toastmasters, which have a relaxed atmosphere to help build confidence and public speaking skills. Offering yourself up to speak at events is another way of creating more opportunities for networking, so it’s something to consider if you haven’t done it so far! Remember you can also network online – social media used to be more commonly referred to as social networks after all, so it is time to take it back to basics. Check out our article on managing your presence on LinkedIn for online networking tips. The bottom line is it’s not just about broadcasting yourself. Think of social media as an ongoing networking event – as intimidating as that sounds it doesn’t mean you have to be posting and messaging people all day long (those are habits that will very quickly get you muted/unfollowed anyway!). It simply means your social media are an open channel which you need to use regularly and interactively to discover and nurture relationships. Finally, if you can’t find the right group or event for you – create your own! Sometimes, things simply won’t happen unless you create the opportunity for yourself, so if you see a lack of events or online groups that fit your current situation – be that as a freelance lawyer, someone who is returning to work or is in the middle of a career change – it’s time to make it happen. With online platforms such as Meetup it’s easy to set up a small monthly lawyers breakfast/lunch group in your local area. Get out there, relax and happy schmoozing!